The White Sweet Spanish Onion is a long-day, standard large sweet onion! This variety is a variation of the Yellow Sweet Spanish, but has a sweet flavor and very little of the sharpness that some other onions have. The White Sweet Spanish is great for soups and salads that require a slight onion flavor. This onion has short storage. There are different kinds of onions, such as short-day onions which grow best in the south and long-day onions which grow best in northern climates. Pick the correct variety for your garden. 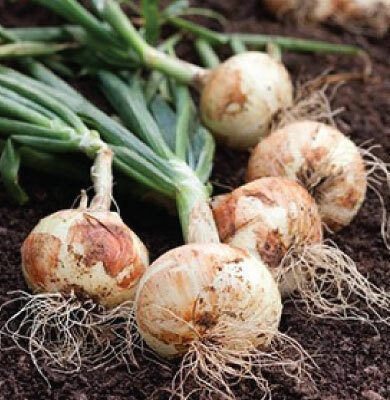 Before Planting: Onions require full sun and fertile, well-drained soil with a pH of 6.0-7.0. Sandy loam soils with good moisture retention are recommended. Add some peat moss can help with moisture retention. Planting: For direct seeding, sow bunching onions at 24 seeds/foot and bulb onions at 12 seeds/foot, 1/4″ deep, rows 12-18″ apart. 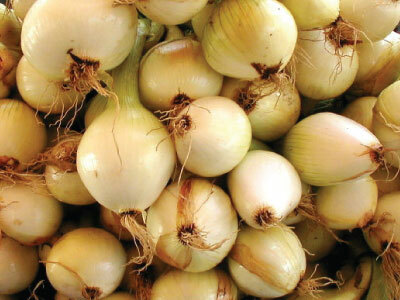 Thin bunching onions to every 1″ and bulb onions to every 4″. In short-season areas, for transplanting sow seeds indoors in flats in late February to mid-March. 2-3 seeds per cell and thin when 2″ tall. Tops may be clipped to 5″ tall. Transplant to the garden 1″ apart for bunching and 4″ apart for larger bulbs. Watering: Onions are shallow rooted and grow best with at least 1″ per week of rain or irrigation, especially during the bulbing phase. Fertilizer: Upon planting, add compost to the soil, but since onions are heavy feeders they will grow best if fertilized throughout their growth. Also, add a timed-release granular 10-10-10 or 12-12-12 fertilizer to spread in the soil. Using a nitrate-based fertilizer will make the onions sweeter at harvest. Days to Maturity: Onions are ready to harvest when the green tops flop over, but they can also be harvested quite early as green onions. For the full onion, once the tops flop over, wait for a dry day to complete the harvest. Harvesting: When necks become soft and tops are falling over, pull and sun-cure at least 2-7 days, depending on weather. Move to a protected location to finish drying. When dry, clip off tops and roots and store in onion bags or shallow boxes at near freezing and 65-70% humidity. 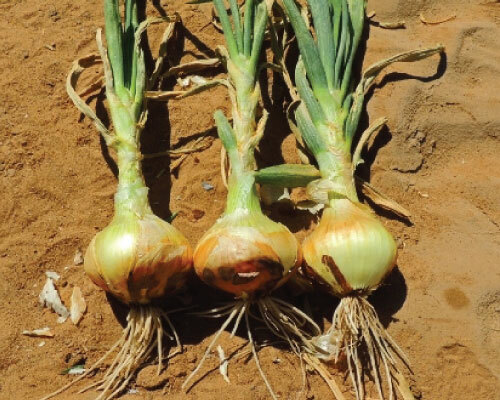 Tips: Onion bulbing is triggered by day length, and maximum day length during the growing season increases from south to north. Short-day onions are grown at lower latitudes in the South, while intermediate and long-day onions are grown at higher latitudes. Refer to “Adaptation” in each variety description for details.